After months of relentless pressure from voters all across the state, Pennsylvania Sen. Pat Toomey finally attended a town hall meeting last night to hear his constituents’ grievances — sort of. 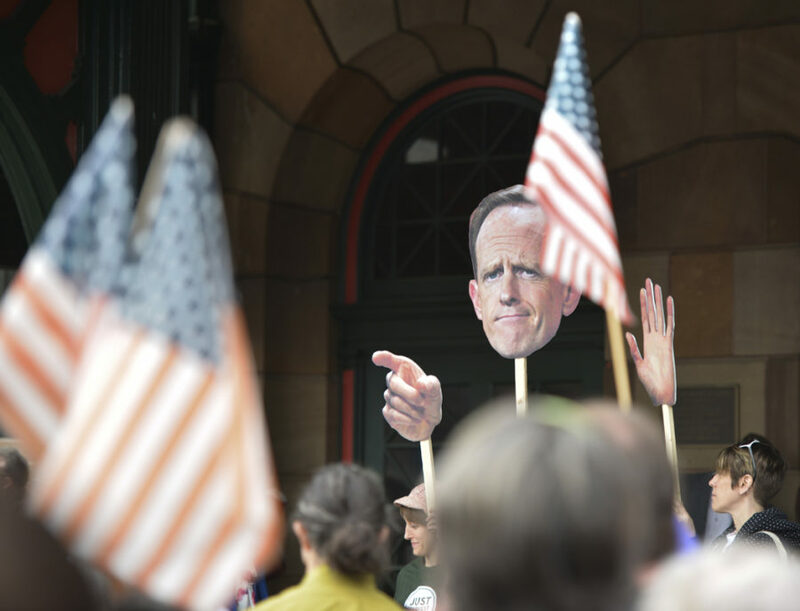 In a PBS-organized special, Toomey appeared for an hour on stage in front of an audience of about 50 carefully selected Pennsylvanians, with an equal number of Republicans and Democrats, and 30 others who were randomly selected. As the PBS moderator promised to remove anyone from the hall they deemed “disruptive,” protesters outside the building gave another perspective on Toomey’s reaching out to constituents. To them, the town hall seemed more for Toomey’s PR purposes than for actually addressing Pennsylvanians’ concerns. Most of the questions town hall attendees asked were about the typical hot-button issues of the summer — including the Republican attempt to repeal the Affordable Care Act and Russian interference in last fall’s elections. And while many of his answers stuck with Republican orthodoxy, Toomey notably took the opportunity to disagree with the President’s remarks about the neo-Nazi violence in Virginia last month. But when one participant pointed out the disconnect between Toomey’s condemnation and his continued support for the president’s agenda, the senator seemed to become uncomfortable. Toomey first suggested that most of his votes in line with Trump were personnel related. “I happen to think [Trump] has put together a very good cabinet,” Toomey said, to laughter in the audience. Of course, support for the American Health Care Act never reached higher than 30 percent in Pennsylvania. But given the curated questions he received, that fact might be hard to tell. A man from South Whitehall, Pennsylvania, complained he had attempted to speak with the senator several times before and asked what it would take for the senator to face his real constituents. Toomey’s response failed to satisfy, as he claimed to get plenty of input through telephone “town halls” and social media. And his dismissal of the concerns of constituents who disagree with him as “disruptive” was disturbing. If Senator Toomey truly wants to hear what his constituents have to say, he shouldn’t bother with small, curated town halls like last night’s. He may as well have been giving a speech. Toomey should listen to his constituents — “disruptive” or not — and take into account what everyone in the state wants. If he isn’t willing to do that, he shouldn’t even pretend to be listening.